Clint Felmingham: Did you know? 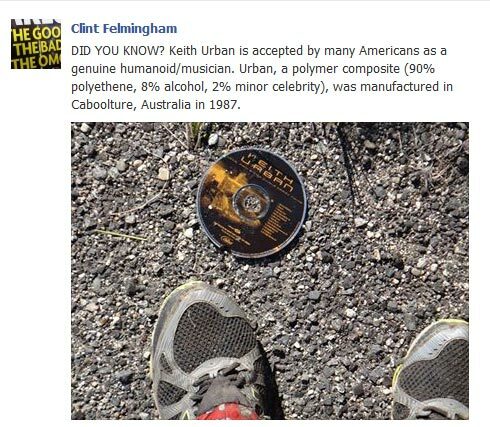 Keith Urban is accepted by many Americans as a genuine humanoid/musician. Urban, a polymer composite (90% polyethene, 8% alcohol, 2% minor celebrity), was manufactured in Caboolture, Australia in 1987. Created about 5 yrs, 6 mths ago (October 14, 2013). Updated about 5 yrs, 6 mths ago (October 14, 2013).